Make your car look new again ! We have been serving the state of Arizona as certified paintless dent removal technicians since 2000. We primarily repair hail damaged vehicles working closely with insurance adjusters. 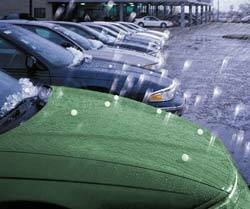 We also serve the retail customer directly with their hail damaged cars and with regular door dings. Paintless Dent Repair is simply bending your car’s sheet metal back to its original shape by pushing very delicately on the backside of the panel. Imagine pushing on the back of the sheet metal with a metal tool, say a screw driver. You might crack the paint before you realize exactly where you are pushing. 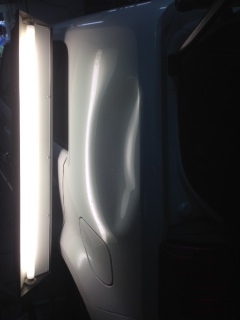 We are able to fix your dents without messing up your paint because we use special lights that guide us and give us the ability to see exactly where to push. We also use specially designed tools that help with the dent removal process by fitting into the cracks and crevices of your auto panel bracing. 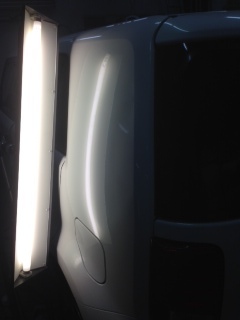 Paintless Dent Repair (PDR) is an art. Not everybody can remove dents successfully. It is a very delicate process that takes years of experience and much patience. •Quality. PDR removes your car dents without paint, and without body work – no mismatched paint, no over spray, no wavy body work, and no paint bubbles. •Price. PDR is less expensive and faster than conventional paint and body work – you get your car back faster. your car look new again. We can also help with your deductable on your insurance. Glass replacement is also available. paintless dent removal and must go to a conventional body shop. The following are frequently asked questions & answers regarding the hail damage to your vehicle. We hope these Q's & A's help assist you in your decision making concerning the recent hail damage you received. My vehicle has damage from the recent hail storm – what do I do now? The 1st step is to contact your insurance agent or claims office. The claims office will schedule a time & location to inspect the hail damage. Since this hail storm has been determined a catastrophic loss by most insurance companies, they will write the estimate on the damage, not the auto body shops. We will work off of the insurance estimate. If additional damage is found (supplement), we will contact your insurance company to get the supplement approved. In some cases, the insurance company will let us write the supplement. Can the PDR technician repair all of the damage to my vehicle? This will depend on the size, depth and location of the hail dents. . This will depend on the extent of the damage to your vehicle. Your estimator will be able to answer that question better when he sees your estimate & your vehicle. Some vehicles will be only PDR repairs, which may only take a few days. Those that need both PDR & conventional body repair (combo repair), will take longer. Parts availability will also determine the length of the repair. Does Accu-Tint provide a warranty on hail repairs?